Properties in New Orleans Union Passenger Terminal average 4.6 out of 5 stars. Property 6: 2-Story New Orleans Guest House-Walk to Streetcar! Property 7: MARGINY'S SLICE OF THE CARIBBEAN --CHARM, CONVENIENCE AND COMFORT!!! Property 12: LEGAL GUEST HOUSE -Little Eazy-Want to support the city and not just the owner? Property 18: Bywater Home w/ Garden | Walk to French Quarter! 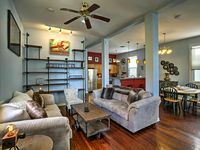 Property 29: DESIGNER ART LOFT NEAR FRENCH QUARTER & FRENCHMEN--AWESOME LOCATION! Property 32: Bywater Home w/ Porch | Walk to French Quarter! 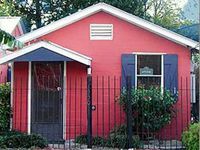 Property 38: NOLA Creole Cottage - 5 Miles to Bourbon Street!